The nature of Ediacara biota preservation, recording soft-bodied fossils instantaneously buried underneath or within events beds (tempestites or ashfalls), is ideal for paleoecological studies as the fossil assemblages are often preserved as census assemblages of in situ organisms. The soft-bodied nature of the Ediacara biota precludes time-averaging and there is no sedimentary or taphonomic evidence for transport in most localities. Namibian localities (and Nama-style preservation in general), where fossils are entombed within storm beds, likely suffer from transportation and possibly sorting by size or resistance to fragmentation; however, it is still possible to reconstruct, in a qualitative sense, the ecological structure of those communities. In contrast, localities from Avalonia, Australia, and the White Sea are ideal for detailed, quantitative reconstruction of the ecological structure of Ediacara biota communities, including the tiering structure and within-community diversity and relative abundance distributions. Sedimentological studies of the Doushantuo Formation indicate a relatively high degree of transport and sorting of Doushantuo biota microfossils, within shallow, nearshore marine environments (Dornbos et al, 2006). In addition to transportation, the small size of the fossils and thus the necessity for sampling by thin section analysis preclude ecological counts, so that paleoecological analysis of the Doushantuo biota is constrained to a more limited level of understanding than is possible for the Ediacara biota. We now have learned enough about the Ediacara biota that we can define a variety of time-restricted assemblages (Narbonne, 2005). 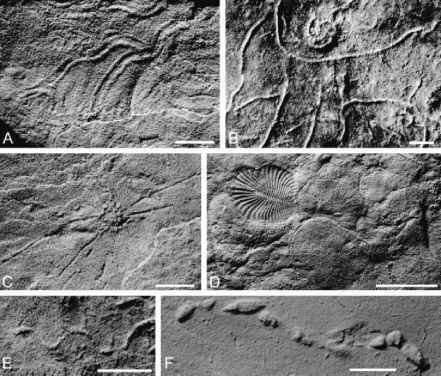 The simple temporal succession of the different Ediacara biota assemblages is, however, somewhat confounded by the geographic, environmental, and to some extent taphonomic, differences among these localities (Waggoner, 1999; Grazhdankin, 2004). It is likely that the ultimate composition of a given Ediacaran locality is dependent on all of these factors to varying degrees, and apparent temporal patterns in the ecological structure of Ediacaran communities must be interpreted with caution as they may instead reflect primarily environmental control or taphonomic overprint. We can also reconstruct the living position of most Ediacaran organisms in relation to the substrate with some confidence, specifically whether they stood upright in the water column, rested directly on the substrate, or were motile as in the case of the bilaterians. What is less clear are their trophic relationships, largely because the specific taxonomic affinities of most Ediacaran organisms remain unknown (Narbonne, 2004, 2005). The conservative assumption, employed here, is that bilaterians were mobile (e.g., Vernanimalcula, Chen et al., 2004), with some being grazers (e.g., Kimberella, Fedonkin and Waggoner, 1997), while others (e.g., Dickinsonia and Yorgia; Fedonkin, 2003) may have absorbed nutrients from the underlying decomposing microbial mat substrate (Gehling et al., 2005). Many others fed from the water column, either as true suspension feeders, microcarnivores, or by absorbing nutrients directly (but, see Grazhdankin and Seilacher, 2002, who interpret forms such as Pteridinium as infaunal) . Tiering is the distribution of benthic organisms above and below the substrate, and is a paleoecological structure commonly determined for Phanerozoic assemblages (e.g., Watkins, 1991; Taylor and Brett, 1996; Yuan et al, 2002). The Phanerozoic summary diagrams on tiering (Bottjer and Ausich, 1986; Ausich and Bottjer, 2001) have included only suspensionfeeders, although other tiering studies have included additional trophic groups. Some Ediacaran assemblages are most likely composed solely of non-bilaterian suspension-feeders, but others include bilaterians. The following presentation of proposed Ediacaran tiering relationships will include all animals of each assemblage represented by body and trace fossils, based on quantitative counts of individual communities where possible.